Abby Laurence is a watercolor artist who has had a lifelong love of flowers. She considers the garden to be the most infinitely beautiful and inspiring place to be. Abby loves to capture the delicate color and exquisite detail found in flowers, or in the faces of cats and kittens, another of her favorite subjects, in her beautiful watercolor paintings. Abby’s flower paintings have been licensed for prints that have been published and distributed worldwide through a publishing house. 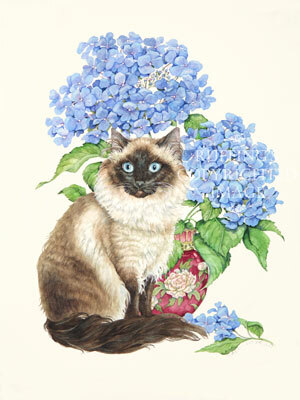 Her floral, cat, and kitten paintings have also been licensed to Candamar, Janlynn, and JCA for needlework kits. You can find original watercolor paintings by Abby Laurence in our Ruffing’s Etsy art shop.